Welcome to the home of Great Falls’ only annual gaming convention since 2012, the Great Falls Gaming Rendezvous! Come join us for a fantastic weekend of playing your favorite games. Be it role-playing, miniatures, board or card games, video games… we have it for you! Plus cosplaying throughout the con, culminating in the amazing costume competition Saturday evening. Or check out the many panels discussing all aspects of our hobbies, from industry guests and local experts. Sign up in advance, or at the door. Check out the games available to join, or find an open table for you and your friends. 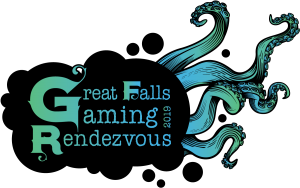 This year’s theme finds the Great Falls Gaming Rendezvous going off Below the Depths! Be part of our Voyage of discovery, Columbus Day weekend, October 10-13, 2019 at the Holiday Inn, 1100 5th St S, (406) 727-7200. Registration will open soon. Recent events of a profoundly serious nature have been brought to the attention of Great Falls Gaming Rendezvous, Inc. through our Safety Committee. While these incidents are not related to any events held by GFGR, Inc., our Board of Directors felt an immediate response was needed to safeguard the community we have built over the years. This response included various actions intended to continue the safety and fun of all our members and attendees. We continue to stress these two factors of safety and fun for all at our events, and remain proud of our record to try and ensure a positive atmosphere for everyone. If there are questions about these policies and actions, please feel free to contact GFGR, Inc. President Robert Thomson at info@gfgr.org or Board member Drew Lovec at gfgrsafety@gmail.com Attn: Drew Lovec.